I have a soft spot for my dad’s scrambled eggs. As a kid, I always asked him to make them for me, over my mom, grandmother, aunt (in our house, I had a lot of great versions to choose from). His were heavy on the pepper, properly whisked and cohesive, not dry, not at all watery. 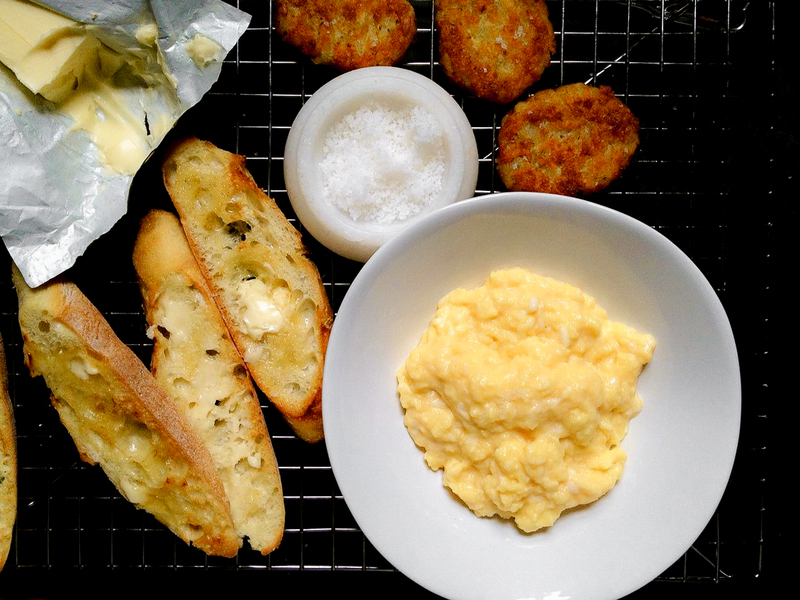 Frankly though, today, I think I make scrambled eggs…well…better. (Sorry/I love you, Dad! Thanks for every time you made me eggs at the drop of a hat! UGH.) How you like your eggs is subjective, but can we agree that you can cook an egg too little or too long? That a technique that leaves you with a rubbery texture or with most of your eggs stuck to the pan can be improved upon? There is a way to end up with the eggs you want, and I think the most important egg technique to master is the scrambled egg: you’re probably making them more than omelettes, who cares if your poached eggs are not perfectly coiled, and you just need a timer to master hard boiled eggs. You don’t need anything more than a little patience and attention to make the best scrambled eggs, not even a non-stick pan, though it helps. The best scrambled eggs, in my opinion, are incredibly creamy and on the wetter side of “done” when they leave the stove, hitting “perfectly done” in the seconds between plating and eating. Yes, seconds, not minutes, so have your slices of toast buttered and waiting on a wire rack and they won’t be soggy or suffer from hanging around for a few. To achieve this, you start with a hot pan that’s then tempered to just hot enough to not cook the eggs much once they hit the pan. And you cook them slowly over this low heat, stirring almost then entire time, which can be quite a long time. Around 6 minutes before they are mostly set, to give you an indication of how low my heat is. I’m not afraid to pull them off the heat if things are progressing too fast. Once I took 12 minutes to make these. Even I thought that was kinda overkill, until I tried them. Let the record show that I still ask my Dad to make me eggs from time to time. Nostalgia makes for strong cravings and love is, arguably, a winning technique too. I tried this once but I don’t think I cooked the eggs long enough. I need to give it another go. you mean cooking them slow over low heat? yeah, as with everything, the first time doesn’t always work out. I will definitely try this recipe as I’m a fan of the softer scrambled eggs than the very well done kind. I also like Laura Caulder’s recipe — http://www.foodnetwork.ca/recipes/recipe.html?dishid=8356. If you can find a video of her making this, from her show, it’s better. I found that more helpful in making the recipe.